It’s been named the National Bison Legacy Act. Interestingly, last Friday, May 25th, 2012, I was sitting and looking out over the great plains of the west, in Wyoming to be exact. I could see both bison and wind turbines in the distance. When I heard the news, I asked Mom what all the hullaballoo was about, bison being elevated to a position of prominence. She explained a campaign had burst forth to Vote Bison! So here it is, your chance to send your Senators the message; it’s time to select this incredible animal to join the bald eagle as a symbol of the United States. Seems numerous Western lawmakers want to make the wild Plains bison more notable, a no-brainy to me. If you have concerns, no one is extending “special rights” to this epic species, no new protections, just added national prestige. Honestly, I believe these icons of America deserve more. To be clear, we are talking wild bison, today estimated at about 20,000 in North America; it is likely about another half million exist in commercial herds. At the peak of the North American bison's presence, nearly sixty million tramped from Mexico to Canada. When Teddy Roosevelt was prez (he was a devoted hunter and preservationist), he got involved to save the “mighty” species from destruction. In the early 1900’s seems only about a thousand remained, they had been hunted to nearly extinction. Are you shocked? The bison have been described as the “thunder of the plains;” pin your ears back (scroll down a bit) for this sound bite. 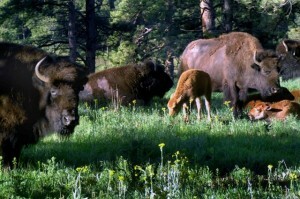 In my neck of the woods, just west of Denver lives a herd of bison; they belong to the City and County of Denver. They are (according to the Jefferson County historical commission report) “descendants of 7 of the remaining wild animals found in Yellowstone National Park in 1914.” So when I need my bison-fix this is where we go, photo below. Ah, don’t forget, Vote Bison! It is in most everything; do you know the truth. Are these nasty ingredients or nature's way? Bugs in food products; Starbucks is admitting using the bodies of ground-up insects in their strawberry frap! 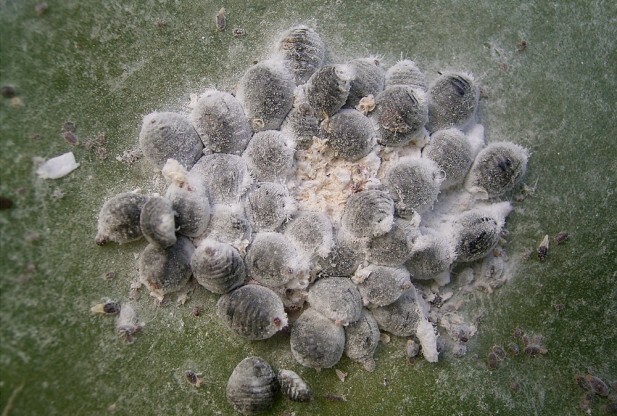 The strawberry base, said a company spokesman does contain "cochineal extract." The challenge (or is it) other than using extract in the first place is the labeling. Like people would know "insect additives" were actually the artificial color or color added and noted on the label. What do we know about these insects, where do they come from and what is the impact? Is beet juice or maybe "real" strawberries an option? Too expensive to use instead? OK humans, beware; not only is the food like juices, colas, gelatins and other processed food using these additives and worse, but so is the cosmetic industry. Since much of the pet food on the market is waste products from human food production can you begin to imagine what manufacturers of the majority of dog and cat are putting in pet food? Wonder why pets and their people are getting more and more chronic disease. Read the label on your pet food and do the research. Be informed and then decide what lifestyle choices YOU want to choose for you and your furry-ones. Read the Starbucks article here. Watch, learn, YOU decide. Let us know what you think? Cedar Dog here: I am a few days out from my 14-year birthday; the big day is April 1, 2012. Yep I “fooled” everyone when I popped on the earth. You’ll recall from my books, I was abused early on, some fellow wanted me to hunt, I refused to be trained for that duty, was beaten and then my trainer found me an incredible “forever home.” Today I am author and politico (I ran for Mayor of Everywhere several years ago raising $5000 for the new Jefferson County Foothills shelter). Last year I established Pets Gone Green University. Now days I work on other sustainability projects that “humans” have a hard time getting their minds around. I always say, “People make things hard, they just confound everything.” I have to say the work I have loved the most was as a Pet Therapy dog to the elderly. I am retired now; I just do what I want. Lately, I’ve had a hankering to write more again. Mom found this article that she and I have been preoccupied with; we thought we’d share it. The writer is Sue Manning from the Associated Press. Her research came up with this factoid; the American Veterinary Medical Association (AVMA) says the oldest cat on record was 34, the oldest dog was 29. Wow, pretty cool! Imagine having one of us around that long. I loved this quote from a Dr. Emily Pointer (you gotta love that last name) in New York, “Well-loved pets live longer than unloved pets." No bombshell in that line! Well the fact is I am thriving; Oh sure, I have a few “ole girl issues” but nothing serious. I do physical therapy at the K-9 Body Shop (they were recently featured on 9-News), that’s where I "walk on water." Really, it’s a treadmill in water for my hips and back, and I get acupuncture every 6 weeks to keep the rest of me in balance. The really grrrreat news, I am on no prescriptions. The supplements I am on keep me perkin’. That way I am free of a lot of toxicity that come from using over-the-counter drugs. My mom does a “snout-to-tail” assessment on all of us once-a-month so as to know of any physical changes that may be sneaking up. I call that “paw-ventive” care. I also get wellness check-ups! One last thing, I bark a lot about “preventive care.” That’s something I see differently than most docs and vets. It is more than screening for the “big stuff,” and it’s more than keeping track of future risks and having changes checked out like lumps and things that don’t go away. Nope for me it is about healthy food, exercise, those supplement add-ons, and keeping toxins out of my body. I have a good time and stay spunky; Mom is always telling me I am spirited and full of it. Send me a Birthday wish and tell me about the age of your 4-legged(s), and what you do to keep them in fine fettle. Email me, leave a comment or both. As many of you know, I sent my transcriber Mom to the Colorado state house yesterday. Her “marching orders,” make our representatives aware of animal cruelty issues. Paws up to her; she went, she worked, her report back last evening was just as I expected, our state house member and state senator are onboard. What’s next? Spread the word - educate more! So come on two-leggeds, we need you onboard. The numbers yesterday were grand, 200 folks “walking their talk” for animals. Were you one of them? The Humane Society of the United States (HSUS) and ASPCA.org sponsored the Colorado Lobby Day. Holly Tarry (HSUS) and Jill Buckley (ASPCA) made clear the job at hand, give animal lovers the tools and direction to spread the word amongst lawmakers. The message, we’re here; we need individual lawmakers to join the conversation with the Colorado Lawmakers Animal Protection Caucus. Pets and their people serve as the paws and feet on the ground for reliable animal protection information. The challenge; provide an organized and efficient medium for protecting animals as Colorado focuses on its economic priorities. Here is what you need to do. Are you with us? Educate yourself on the issues. Be willing to show up and talk to your state lawmakers. We’ll support you and go along if need be. For the record, I describe her art (in my books) as nothing short of stupendous. 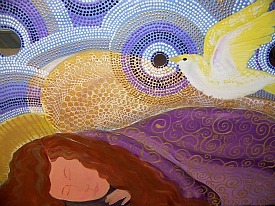 She and Mom took “my images” and cast them into “words and drawings” that tell a story of my passion for the earth. 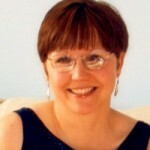 The header of this blog is an example of her work in my books. Do you know how your pet impacts the earth and how you impact your pet’s health; what you are going to do about it and who are you going to tell? We discuss the choices pet parents have in caring for the environment and our health. It is not complicated, take my word for it; this is something you need to know and you will want to do. In fact, it is fun. 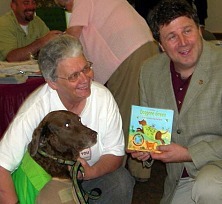 I urge you to pick up copies of my books, Ernie by brother and I co-authored the second book for kids in 2009, Doggone Clean and Green: Eco-Solutions for a Pet’s Daily Life (see my online special). Also, check out my NEW Pets Gone Green University for a list of courses we teach. After that go to Vickie’s reception Friday evening February 4. You will be glad you did, I guarantee it. 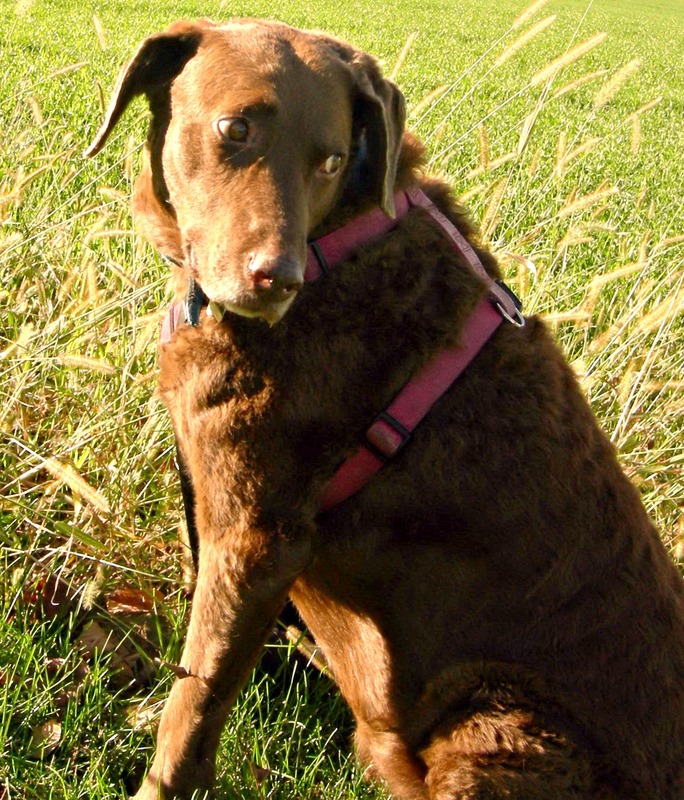 Cedar Dog for Mayor™, a twelve-year old Chesapeake Bay retriever, author, and pet therapy dog announced today that a new business is opening in Wheat Ridge, Colorado. The curly-coated canine will introduce the new pooch-training center to the community on Friday, January 7, 2011. Wheat Ridge Mayor, Jerry DiTullio will join Cedar Dog for the center’s official ribbon cutting ceremony. Colorado Paws is a professional group of animal care specialists who have linked-up to offer pets and their companions a diverse education and training class line up; Baking Healthy Treats, Canine Colors, Canine Massage, Compassion Fatigue, Experiential Dog Training classes, Pet Loss and Grief Support, Pet Tech First Aid and K9 Nose Work to name a few. Cedar Dog for Mayor is also launching her latest initiative, Pets Gone Green University™ at the new facility. The Spring Semester offerings include two-FREE classes, Knowing Your Pet’s Impact on the Earth and Knowing Your Pet’s Health. The Pet Food course—What is in Your Pet’s Lunchbox—is sure to be all the rage. As a dog in the course of animal and human events, I stand for champions, two-leggeds, and often special four-leggeds who serve and work tirelessly everyday to benefit lives. I remind “pets everywhere” the importance of “celebrating our humans.” We need two-legged backing to make projects for animals work. In Jefferson County Colorado, humans have championed parks for dogs, built the new Foothills Animal Shelter, and have passed laws to ensure that “pets and their people” have safer communities. Today, I add a human’s name to the hall of fame, Jeffco County Commish, Kathy Hartman. Sunday, September 26, 2010, I invite you to join me at my booth in Arvada, Colorado at the Off-leash Dog Park Festival. At 10:30am, I will make the announcement and endorse a champion for animals and their people; I have a “nose” for picking winners, which is why I will give Jefferson County Commissioner candidate Kathy Hartman’s re-election bid my “paws-up! As a Doggone Green Crusader and candidate for mayor, one of my missions is to help end animal homelessness and abuse; a big part of that is supporting shelters, which I dub “recycled love zones.” A shelter’s job is to look after and find “forever homes” for down-and-out pets. Too often, economic woes mean bad times for the animals. These days more and more two-leggeds find they can no longer afford the cost of keeping us or worse pets are given up for adoption or abandoned when their pet parents lose homes to foreclosure or eviction. 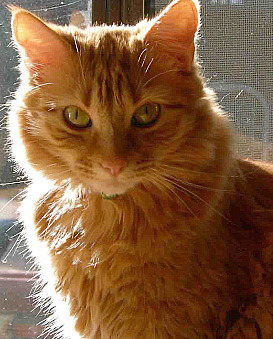 Shelter populations are on the rise; it is worse for cats. Mom and I trekked out to visit Jefferson County Commissioner Kathy Hartman in late 2008 regarding the new-fangled (and badly needed) Foothills Animal Shelter. I had asked Mom to set an appointment because I was fed up. This dilly-dally of approving a new animal shelter had gone on way too long. I said the animals were being short-changed. I wanted to know what the hold-up was and what we could do to move the new animal shelter project forward. I was being “paw-litical" which I urge every one of you to do too. The Cedar Dog for Mayor Campaign is working to raise funds for the NEW Foothills Animal Shelter Foundation. Cast your vote for me and my feline running mate Hillary at Cedar for Mayor. 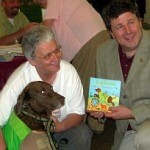 I am working with Commish Hartman and her dog Clover to truly make a difference and get "paw-litical for the animals." A vote cast with every $1 donation to my campaign goes to the shelter fund. I am the author of two books, Doggone Green, and the sequel Doggone Green and Clean, which provide environmental tips and solutions for pets and their people. My books rock, they have humor and are entertaining. I work as a pet therapy dog, blogger, and make public appearances to promote my environmental agenda as a candidate for mayor. I am a rescue dog. My transcriber is my Mom, Kathy Deitsch. The new shelter is an open-admissions facility - never turning an animal away. It opened in August 2010 and sits on three acres of land at the Jefferson County Fairgrounds. The facility is approximately 30,000 square feet in a single story building. Cedar’s fundraising campaign ends on December 31, 2010 at which time she will move on in service to other animal fundraising causes. For the last 25 years Kathy Hartman has been working to make Jefferson County a great place to live, work and enjoy. Prior to becoming County Commissioner, Hartman helped Jeffco families as the Director of Stride, a nonprofit that helps families move from welfare to work. 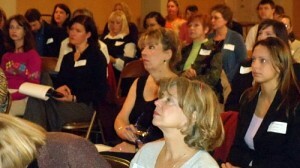 Hartman also taught investment classes utilizing her background as a stockbroker and her MBA. As a former Open Space volunteer Hartman cultivated a love for the beauty of Jeffco’s mountain backdrop and environment. 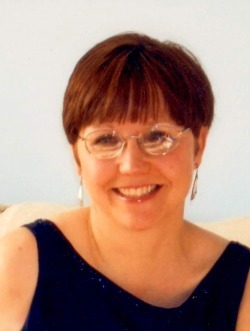 Kathy lives with her husband, Bill, a small business owner in Littleton with their two dogs. As County Commissioner, Hartman has made an open and accountable county government, protecting jobs in the county and expanding open space priorities. See Hartman on Facebook. The way I see it, dog poop is a paw-dicament. I have always said if you have a dog, it is your job to “scoop the poop.” If it is not your “cup of tea” sign up with a pet scooper service, have someone walk your dog or maybe don’t have a 4-legged that poops outdoors. Do not bring shame on your 4-legged by failing to “scoop” in your backyard, on walks, and in parks. If you live in an apartment or condominium, poop pick-up is not negotiable. Don’t make this a problem by ignoring your job. Dog poop is a health hazard, an issue of water quality; dog poop is not fertilizer. Forty percent of pet parents do not “stoop to scoop,” more men than women do not pick it up. Dog droppings are one of the leading causes of E. coli pollution. A gram of dog poop has over 20,000,000 E. coli colonies in it. You may not think a modest mound of poop could be a dilemma but the combined effect of thousands of dogs (and yes, cats who eliminate outdoors) in a metro area can create havoc to the soil and water supply. Unlike wastewater from homes, storm water is typically untreated. When pet parents fall short and do not “stoop to scoop” the poop and disease-causing bacteria mixes with storm water runoff and meanders into waterways; that is a big deal when you think about clean water. Source: Doggone Green book. I predicated a while back that DNA analysis of dog poop would come to the U.S. Several years ago Germans thought DNA testing, that is matching “poop to pooch” would solve a nasty crisis, too much dog poop on public property. The plan, gather waste samples from all dogs at the time of licensure. Build a registry of the findings. Sanitation workers would cart around feces-sample kits submitting poop to a lab where doo-to-dog is matched, offenders are identified and fined. The city stood to turn a profit; the problem would vanish or would it? In May of 2010, a lavish condominium in Baltimore thought this might be a good idea as well. Have all canines’ tested, examine unauthorized poop and fine the offender. In the end, the plan was pooh-poohed. As a dog, I embrace a more paw-active approach, a “stoop to scoop” dog poo removal. I also believe we can fetch a more advanced and tech-savvy solution for throw away. Here is where I need your help. I do not want my poop going to the landfill, tons of poop piles, too many plastic bags that sit in the landfill for years.If you are trashing the poop, I suggest compostable bags made without petroleum products (biomass instead) and made in the USA. What to do with it, how about composting the stuff and selling it as doggone good compost for shrubs and bushes around the yard, currently the mission of Envirowagg.comin Denver, CO. You can learn vermiculture, worm composting, get your own doggie septic-style waste disposal system or do it the natural way, bury it and let nature do its job. The EPA advocates flushing your dog’s waste. Don’t forget the food your pet eats; some of it is downright junk which equals large, smelly stools. What you feed your pet can make a huge difference, “quality food in means better absorption and less out.” If you are a lazy pet parent and you don't "stoop to scoop" at least “dish up” a first-rate food. Finally, ask your dog to do what I did; I bought my family a pooper scoop and rake set. I am a decisive candidate, a value I bring to the campaign for Mayor. A couple of weeks ago I announced my choice of running mate, my feline sister Hillary who brings an extra set of “paws on the ground” next to mine. It strengthens my candidacy, as Hillary is a doggone good choice; she is smart, in charge and adorable. She is all the rage, she will swing votes our way; she brings balance to the mayoral ticket. She is everything you would want in a Mayor, a trusted guide and in the event I am away, visiting out-of-state or internationally, she will be here to serve. Hillary for Deputy Mayor It is Time for 4-Legs and a Tail. One Dollar Buys One Vote. Stack the Ballot Box for the Animals. VOTE Early, VOTE Often, VOTE Here, NOW! Mom and I came across the coolest (no pun intended) campaign today. Thought we would share it as it is a matter of highest importance. It's called "Don't leave me in here, it's hot" campaign. As a bit of background, I wrote in my first book, Doggone Green: A Call to Action to Save Our Earth a chapter on avoiding doggie danger in the great outdoors. It was on "overheating." I explained that "warm weather dangers prevent me from running as many errands with Mom as usual; meaning I have to stay home in the warmer months so as to stay safe and cool. It's my nature to want to 'go' and keep her company (as we have a lot to woof about) as well as keep her safe. I have had to listen and 'stay' home ever so reluctantly." A 14-year-old Golden retriever named Delta died in the car while her owner shopped at Costco on a 104-degree day in Frederick, Maryland. In New York, a six-pound Maltese died in a 140-degree car while his owner went for a swim in a state park. A Wisconsin woman left her pit bull in her car at Wal-Mart while she attended a court matter. Police broke the car window and tried to save the dog, but he died at the scene." Bottom line, pass the word along; it gets hot in a car on a warm day. It can be just doggone dangerous. So better do as I do and just rest in the cool house under the ceiling fan and wait for a cooler day. Check out My Dog Is Cool There are down-loadable posters, fliers and all kinds of helpful educational stuff. The UAN was founded in 1987. They focus on "bringing animals out of crisis and strengthening the bond between people and animals through a variety of programs, including emergency sheltering, disaster relief services, financial assistance and education." If you haven't VOTED for me yet I need your support. Click the VOTE button (at the right) and learn about my paw-litical work. Signup to receive Cedar's Newsletters! © Copyright Pets Gone Green 2007-2019. All rights reserved.